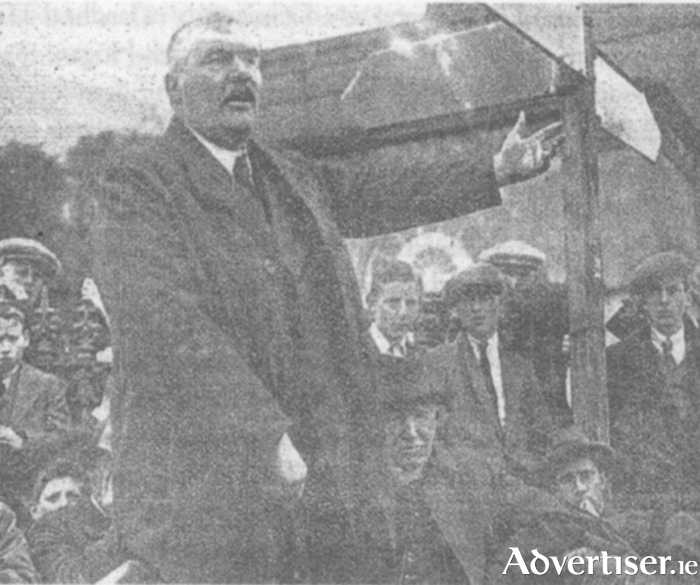 Máirtín Mór canvassing in Clifden during the June 1927 election. The outbreak of World War I brought to a head the divided camps among Irish nationalists, both of whom wanted Home Rule, or Independence, but both saw different ways to achieve it. Probably because of the large army presence in the town, and the natural benefits that the army brought to traders, as well as the family connections that had developed over the years between town and soldiers, the majority of people in Galway town favoured the British military approach. The leader of the Irish Parliamentary Party, John Redmond, encouraged young men to achieve Home Rule, which would be revived after the war, by joining the armed forces, and fighting for Britain. The Sinn Féin answer was to boycott army recruitment and, secretly, to plan an armed rebellion. It advocated that the war, which demanded enormous resources and political will and focus from the British, was an ideal opportunity to strike. Máirtín Mór McDonogh, was 54 when war broke out in 1914. He was already a legendary figure among business associates throughout the land. With astonishing energy he had significantly expanded his family’s sawmill business to become a gigantic enterprise, importing and controlling all the coal, fertiliser, iron and timber needs of the west of Ireland, becoming, by far, its largest employer. He chaired every significant board in the region, including the urban and county councils. He was a committed Home Ruler along the lines advocated by Redmond. He was a tall man physically, with a quick temper. He wielded enormous power through his business dealings and wealth. He did not suffer Sinn Féiners nor trade unionists lightly. At an important recruitment meeting at the Town Hall there was uproar at efforts made to disrupt the meeting, which were dramatically dealt with by McDonogh who took the chair. There were fears that some Sinn Féiners might try and disrupt the meeting. Some continguencies were prepared, but no one seemed particularly worried. In attendance were the UCG president, Alexander Anderson, and three Galway MPs, Stephen Gwynn, William O’Malley and W J Duffy. Gwynn was already a serving officer with the Connaught Rangers, and was in mid flight endorsing Redmond’s call for the formation of an Irish Brigade, when suddenly the whole place was plunged into darkness. Resolving matters physically was often the way with Máirtín Mór McDonogh. During the first two decades of the last century there were there were bitter disputes between employer and labourer, both in Dublin and other Irish cities. The infamous Dublin Lockout in 1913 had its mirror image in similar disputes in Galway. Negotiations for a wage increase broke down, resulting in Galway employers imposing an immediate lockout in 23 workplaces that left approximately 600 people out of work. McDonogh, chairman of the Harbour Board, endeavoured, with the help of other employers, to unload ships themselves. They were unused to negotiating with unions, and initially refused to do so. Especially as the Galway dockers had become members of the National Union of Dock Labourers, based in Liverpool. McDonogh resented union interference in the running of his various businesses. Eventually he appealed to the Shipping Federation of Great Britain for help. Forty non-union men were sent over and, despite tension and anger from the dockers, work unloading ships continued. When they had finished they were escorted to the station by a force of 180 policemen. Despite the frustration and anger, there was only one incident. An English worker strayed into one of the McDonogh yards, only to be confronted by a woman named Murray. She promptly hit him over the head with a frying pan. When released she was escorted home ‘by a cheering crowd of strikers and sympathisers’. Back at the recruitment meeting when a teacher named Madden from the St Ignatius’ College enquired from McDonogh and the MPs ‘Who gave the Irish Party authority to act as recruiting sergeants?’, he was rounded on and received some ‘rough handling’. The police intervened to rescue him. Stephen Gwynn continued with his speech, concluding with ‘God save the king’, but a voice cried out from the crowd, ‘God save Ireland! NOTES: *I am taking this week’s Diary from He Was Galway - Mártín Mór McDonogh, 1860 - 1934, by Jackie Uí Chionna, on sale €20. ** From John Cunningham’s A Town Tormented by the Sea - Galway 1790 - 1914. *** Stephen Gwynn (1864 - 1950 ) was a member of the Irish Parliamentary Party for Galway during the crucial years 1906 - 1918. He served as an officer with the Connaught Rangers, often at the front during World War I. His moderate nationalistic leanings were, however, eclipsed by Sinn Féin. After the war he devoted himself to writing political, literary, and personal memoirs, notably: A Holiday in Connemara (1909 ). ****Apart from his careers in industry, local politics and horse racing Máirtín Mór successfully stood for election to the Dáil as a Cumann na nGaedheal candidate. He was elected in September 1927, lost his seat in February 1932; elected again in 1933 until his death the following year (additional notes by Shaun Boylan ).